Your circadian rhythm is an ingrained biological clock that regulates the timing periods of tiredness and wakefulness throughout the day. Your body clock is calibrated by the appearance and disappearance of natural light in a 24-hour period. The term circadian is derived from the Latin "circa diem" meaning "approximately a day." The functions of your circadian rhythm are based in the part of the brain known as the hypothalamus. Within the hypothalamus are a group of cells known as the suprachiasmatic nucleus (SCN), which is connected to our optic nerves that sense changes in light. The SCN is also responsible for regulating many body functions that revolve around the 24-hour cycle including: body temperature, heart rate, blood pressure, and the release of hormones such as melatonin which helps us with sleep. In the mornings when light first hits our eyes, our body temperature and blood pressure begin to rise, our heart rate increases, and there is a delay in the release of melatonin which helps us wake up. 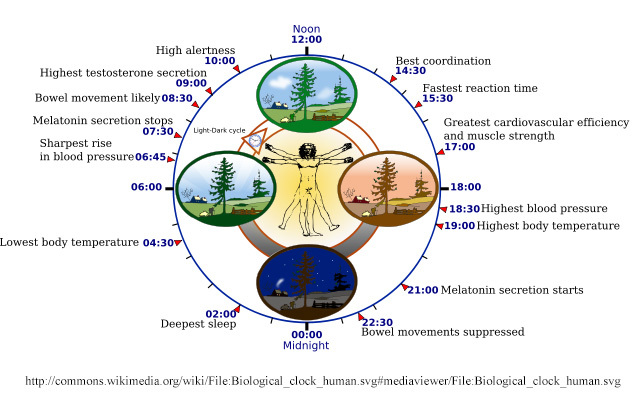 Throughout the day our circadian rhythm increases and even has a dip during the day before decreasing at night as our body functions slow down and melatonin begins to release again to help us sleep again. For most people, the body clock is set for sleep to begin around 11 p.m. and make us rise around 7 a.m. Although there is some deviation for each individual this clock is the standard norm. Most people are sleepiest between 2-4 a.m. and again between 2-3 p.m. (although most rarely nap), and most alert in the early mornings and late afternoons. Some people's circadian rhythms just aren't the same as others, and their body responds differently at times that are irregular to others. Other people must work jobs or have school schedules outside of normal times to meet the growing demands of a 24-hour society. Conflict is created when people's circadian rhythms don't sync-up with everyone else's. So what happens when a person's circadian rhythm is disrupted by external forces or circumstances (demands from jobs, schools, or travel) or their own biological clock is offset from the majority of society? People begin to develop circadian rhythm sleep disorders, and if left unchecked can lead to issues ranging from exhaustion and confusion to medical problems such as obesity, diabetes, depression, and dementia. There are two basic categories of circadian rhythm sleep disorders: those that are intrinsic (built-in) and those that are extrinsic (circumstantial). Intrinsic disorders are those in which a person's body clock is substantially off from the rest of societies. It can either be that they go to sleep and rise later than usual, go to sleep and rise earlier, occurs later and later each day, or is fragmented. 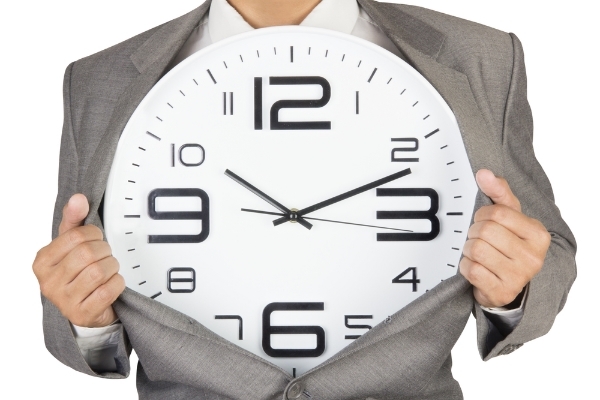 Extrinsic disorders are those in which the person's circadian rhythm is in sync with typical light/darkness patterns but due to jobs, school, or travel demands have their clock disrupted by their uncommon schedules. Delayed sleep phase syndrome is characterized when a person generally feels tired later at night than most people causing them to stay up later. Even though they stay awake later into the night, these people still require the same 7-9 hours of sleep that most others require and would typically rise later in the morning as well. For these people, melatonin production doesn't usually begin until 2 or more hours later than it does in most other people, which cause them to stay awake later. However, while their melatonin production is delayed, it lasts roughly the same amount of time, making early rising more difficult. Where people with DSPS run into trouble is when their body clock doesn't match up with job or school start times. These people are often forced to wake earlier than their body is prepared causing them to lose a few hours of sleep every night. Many people with DSPS complain of late night insomnia, excessive daytime sleepiness, and have an increased risk of depression. DSPS can be found in persons of any age, but is most common in teenagers (about 7%) and usually develops around the age of fourteen and lasts into their early to mid twenties. Because DSPS is so common in teenagers, there is some headway being made into changing school start times to reflect the sleep needs of teenagers. Advanced sleep phase syndrome is a disorder in which people feel sleepy earlier in the evening causing them to go to bed earlier than most others. It is similar to DSPS in that people with the condition require the same amount of sleep as everyone else but instead feel the need to go to sleep 2 or more hours earlier and rise 2 or more hours earlier as well. For these people their melatonin levels and body temperatures cycle much earlier than most others. Many people with ASPS complain of early morning insomnia, insufficient sleep, and excessive daytime sleepiness. People with ASPS are also at a higher risk for depression. Advanced sleep phase syndrome can affect both men and women equally but is more common in the elderly. Roughly 1% of people middle aged or older experience ASPS. People who have non-24-hour sleep-wake syndrome (aka free running disorder) have a circadian rhythm that is out of sync. It causes these people to have slightly longer than 24-hour sleep cycles and causes their body clock to shift to later bedtimes every couple of days, making them go to sleep and rise at later times each day. Non-24 hour sleep-wake syndrome is most common in blind people. The disorder is believed to be caused by the failure of light to reach the SCN, which allows the circadian rhythm to "run free" rather than be relegated by patterns of light and dark. It is believed that as many as half of totally blind people suffer from the disorder. The disorder is less understood in sighted people suffering from non-24 hour sleep-wake syndrome. This circadian rhythm sleep disorder occurs in people who have sleep-wake cycles that are not defined by any typical patterns of sleep. Instead, their sleep occurs as various "naps" throughout a 24-hour period that usually adds up to a normal sleep cycle of 7-9 hours. For these people there is no regular pattern and their nap times and durations can vary on a day-to-day basis. Many sufferers of irregular sleep-wake rhythm complain of insomnia (because they can't sleep normally at night), excessive daytime sleepiness (because they feel the need to nap during the day), or both. This circadian sleep rhythm disorder is extremely rare but is more prevalent in sufferers who have other medical or mental disorders such as dementia, brain damage, and mental retardation. Shift-work sleep disorder occurs when a person's circadian rhythm comes conflicts with their work schedule causing them to experience insomnia or excessive daytime sleepiness. 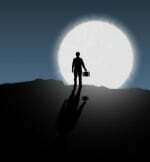 Shift-work is characterized by working hours outside of the traditional 9 a.m. to 5 a.m. schedule. It includes the early morning shift, late evening shift, the night shift, and rotating work schedules. Many people with set schedules such as early morning shifts and night shifts can adapt to their schedule if it is regular. However, people who work rotating schedules are at most risk as not having a regular schedule can wreak havoc on their circadian rhythm. Jet Lag occurs when a person quickly travels by plane to a new time zone, often one that is a few hours off from their home location. Jet leg most often occurs 2 time zones away from home. At the new location the person has to adjust to a new sleep-wake cycle that is at odds with their circadian rhythm. Jet lag is often harder to adjust to during eastward travel, as the new schedule requires earlier awakenings rather than later ones. Jet lag is often a temporary disorder and the new time zone can be adapted to within a few days. However, jet lag disorder can be more serious for frequent fliers whose jobs require constant travel. Jet lag is often more difficult for the elderly to adapt to than the young. Depending on the circadian rhythm disorder, certain behavioral or lifestyle remedies may help alleviate symptoms of the disorder. Adjusting exposure to daylight. Those with delayed sleep phase syndrome should minimize exposure to electronics that mimic daylight (laptops, TV’s, cell phones, portable game consoles, etc.) and those with advanced sleep phase syndrome should increase light exposure in the evenings. Light therapy can be used to help advance or delay sleep through the use of a high intensity lightbox. Bright light therapy helps in calibrating the circadian rhythm by having the user sit in front of the bright light box at appropriate times of the day (depending on the disorder being treated) for a varied amount of time (depending on doctor recommendations). Certain medications may be prescribed depending on the type of disorder. Wake promoting agents or sleeping aids may be prescribed. Melatonin, the hormone that helps regulate sleep, may be prescribed to be taken at certain times to help reset your internal body clock. Living with a circadian rhythm sleep disorder can be extremely frustrating for many sufferers. For many of these people, their sleep patterns could give them the regular amount of desired sleep that their bodies need. Unfortunately, external social factors often prevent these people from getting their desired sleep amount and their health often suffers as a result. If you are suffering from a circadian rhythm sleep disorder (or any sleep disorder) and you're concerned about your health or mental well-being, it may be time to speak with your primary care physician or a sleep clinic for expert advice. At The Alaska Sleep Clinic, our highly trained staff of sleep specialists has helped diagnose and treat tens of thousands of Alaskans over the years suffering from sleep disorders. We understand that a good night's sleep is critical to people's health and happiness, and we are committed to providing quality service in the treatment of a variety of sleep disorders. If you have concerns about your sleep health and live in the state of Alaska, click on the link below for a free 10-minute phone consultation with one of our sleep specialists.